We are constantly dealing with situations that result in stress, anxiety and a general feeling of being unsettled. Fear and anxiety go hand in hand, and the yearly rate of prescriptions written for anti-anxiety drugs has more than doubled in the past decade. 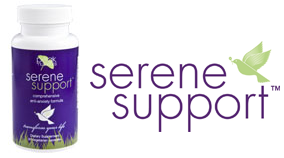 Serene Support™ is a natural anti-anxiety formula containing key ingredients that provides an overall calming effect, optimizes neurotransmitter function, improves sleep quality, and helps restore the delicate brain chemistry balance. SALE!! 10% OFF regular price. Bottle exp stamp 7/2019. Sorry, no returns or refunds on sale items.